Prices above are only indicative rate and are based on two people sharing a double room. The price may vary depending on the season of travel and the number of people you will be traveling with. Contact us with your travel dates and we will extend to you our discounted rates for Sandies Tropical Village. Sandies Tropical Village the perfect option for visitors looking for all-inclusive comfort and fun. 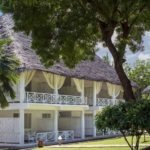 With its thatched roofs and palm-tree-lined beachfront property, Sandies Tropical Village is an idyllic doorway to the dazzling white beaches of Malindi, Kenya. 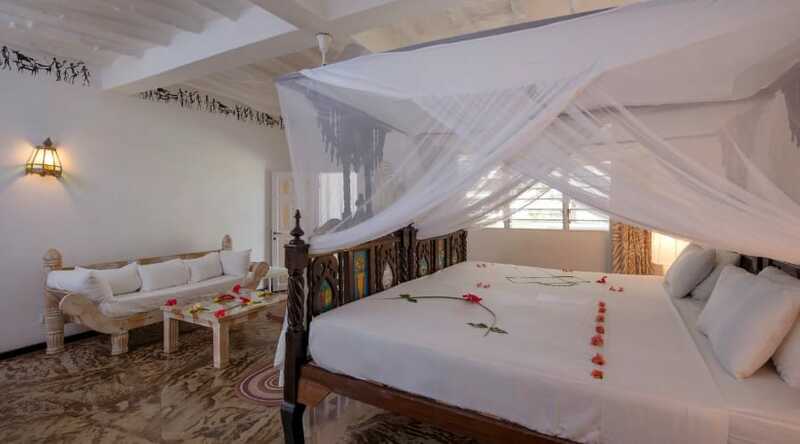 Guests can walk directly from their rooms to the beach and will be thrilled to waste no time. 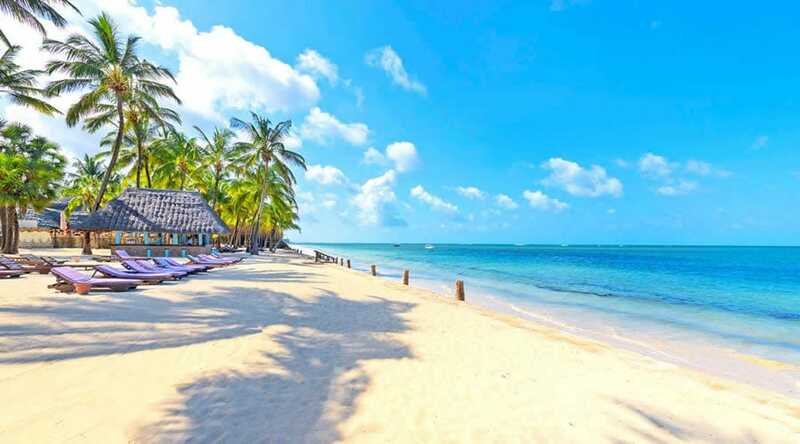 They will enjoy the powdered-sugar sands and luminous azure waters of one of the Indian Ocean’s most splendid beach towns. 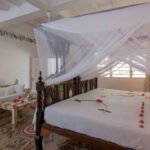 Sandies Tropical Village houses 109 comfortable, air-conditioned rooms –Superior, Deluxe, or Junior Suites – with basic amenities and services. 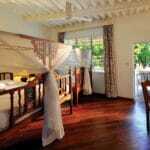 All rooms have king-sized or twin beds with a mosquito net, a fan, a refrigerator, a telephone, and a digital safe. The large en-suite bathrooms are equipped with showers, basins, hairdryers, and sockets for electric razors. WiFi services are available (free for all-inclusive guests and free in public areas for half-board guests). 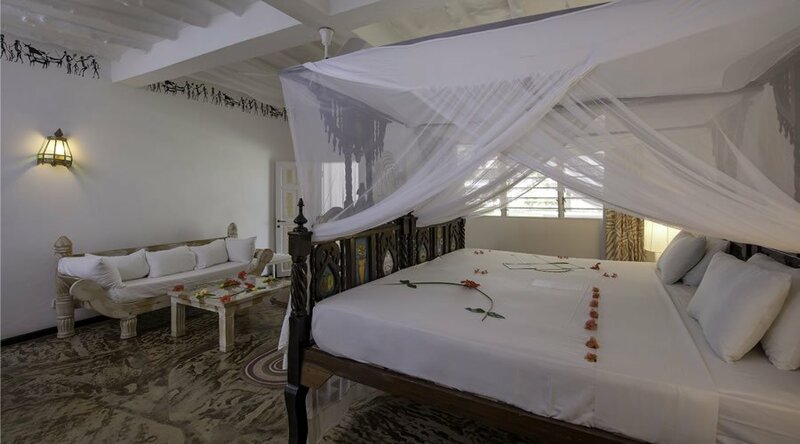 Each Superior Room comes with a private covered balcony or partitioned patio. 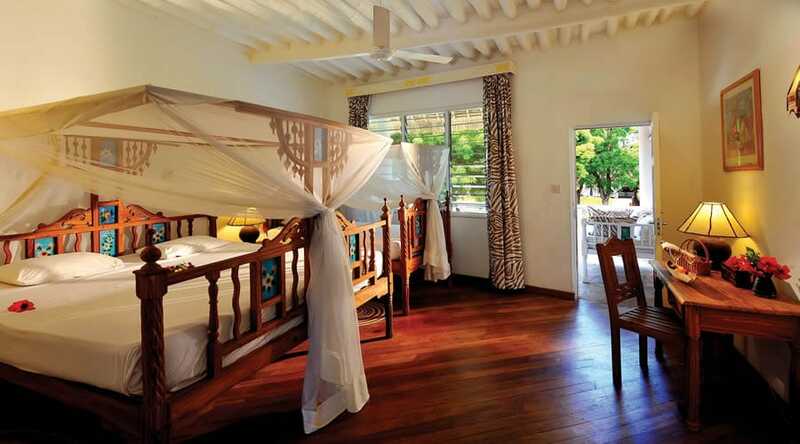 Deluxe Rooms are slightly larger and include a sitting area with a day bed, plus a balcony or patio. Junior Suites are considerably more spacious with complimentary laundry and turndown services. There are other amenities included in the Superior and Deluxe Rooms. Guests in Junior Suites can also request room-service breakfast each morning. 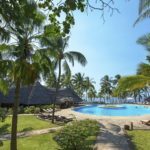 Sandies Tropical Village also offers on-call doctor services and childcare upon request to ensure a stress-free stay at one of Kenya’s finest coastal treasures. 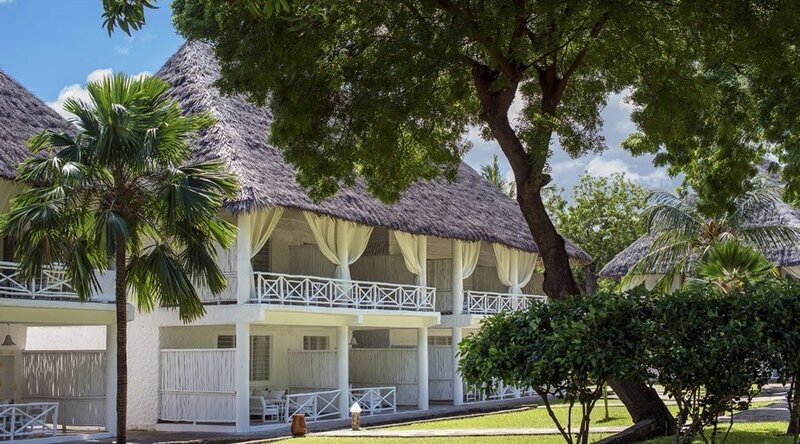 Ready to book your holiday at Sandies Tropical Village ? Contact us for the best rates. 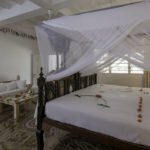 Sandies Tropical Village provides access to a PADI certified diving center and water sports center for guests looking to make the most of their oceanfront vacation. Guests are also welcome to use the Mvua African Rain Wellness Center at the nearby Diamonds Dream of Africa resort, which includes a full gym for fitness and exercise needs. 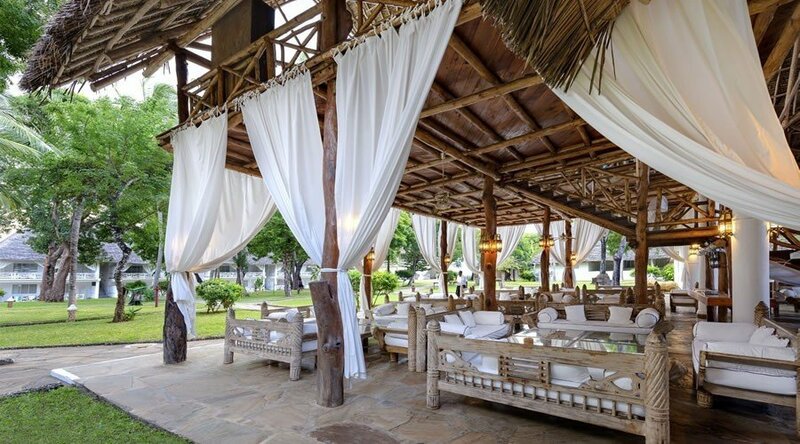 A variety of spa treatments are also available at the Mvua African Rain Spa for guests hoping to indulge in deep relaxation and rejuvenation. 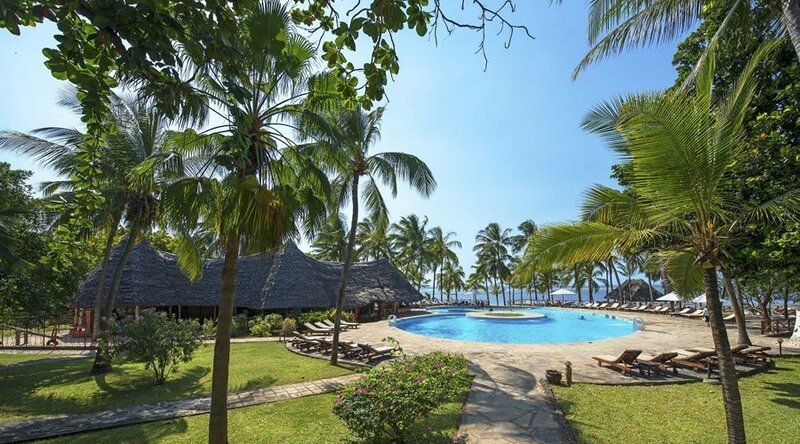 And Sandies Tropical Village’s serene outdoor pool mirrors the spectacular turquoise water of the Indian Ocean a few steps away. 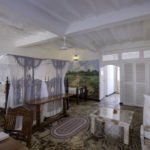 There are 36 Superior Rooms built on two levels, featuring private balconies on the first floor and covered terraces for rooms on the ground floor. 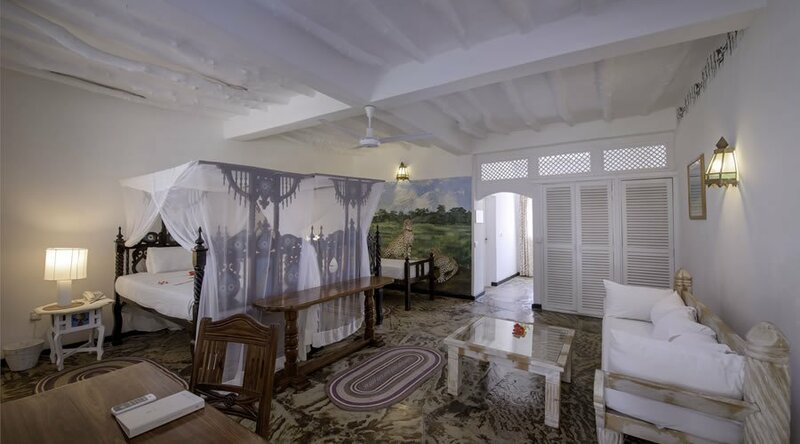 The style is a combination of English and Lamu design. The main restaurant serves breakfast, lunch and dinner at buffet in a fusion of International and Italian cuisine. Vegetarian menu is available upon request. The Tropical Restaurant is Sandies Tropical Village’s buffet-style main dining area, offering a variety of dishes – including Italian and international fare – and beverages. (Vegetarian options are also available.) 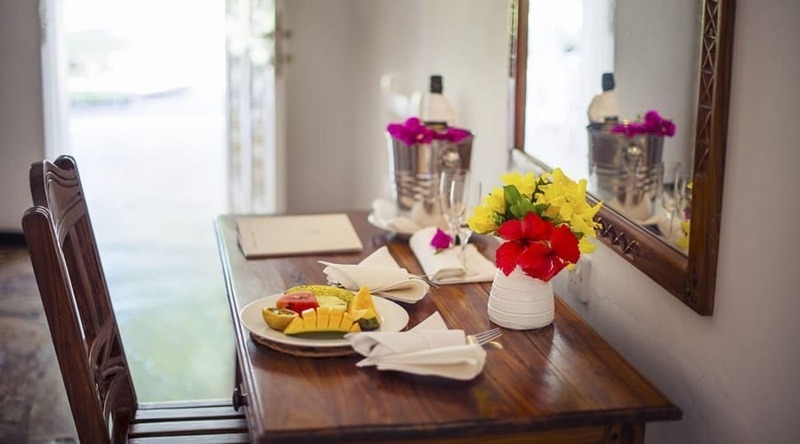 The all-inclusive package includes three daily meals here, and the half-board includes breakfast and dinner. The Savannah a-la-carte restaurant is not part of the all-inclusive price, but it offers a fine assortment of specialty seafood dishes and wine pairings, so guests are encouraged to book their table in advance. 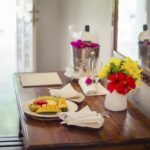 For cocktails, snacks, juices, coffee/tea, and soft drinks, the Tropical Jahazi Bar and the Tropical Beach Bar are open at specific hours throughout the day and evening. And for a little nighttime fun, the Disco Bar serves alcoholic and non-alcoholic beverages after 10pm. 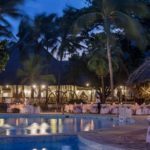 All-inclusive guests are treated to daily activities (such as a coconut-throwing contest), evening entertainment, table tennis, and disco. Guests hoping to shop will love Spherique Boutique, Sandies Tropical Village’s onsite destination for locally made beach clothing. 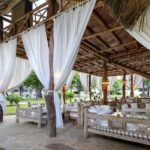 The nearby resort spa offers a variety of massages for guests looking to maximize their vacation relaxation, as well as Thai stretching sessions to stay loose for a day at the beach. 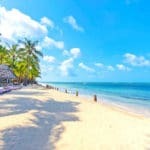 Guests can organize their own games of beach volleyball and beach soccer and partake in other activities and lessons organized at the Mvua sports center and PADI diving center such as Catamaran excursions, canoeing, and aqua aerobics. Sandies Tropical Village’s conference facilities are perfect for businesses hoping to treat their partners to an event to remember. Their attractive and spacious conference room comfortably accommodates up to 60 people. 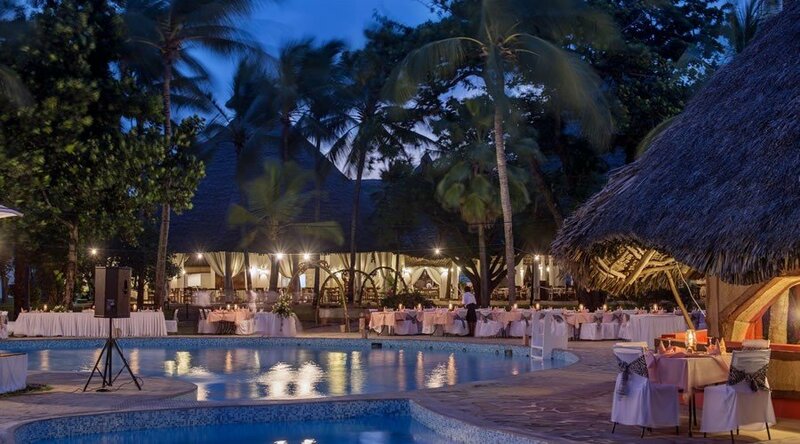 Sandies Tropical Village’s extensive campus is also ideal for outdoor events and wedding receptions with ocean views, breezy palm trees, and poolside lounging areas that can be converted to tables for candlelit dining after a beautiful African sunset.